August 2007 Online Casinos News. August 31, 2007. Three New 5 Reel Video Slots Games From Microgaming In Challenge Online Casino. Microgaming continue to add new games to its online casino gaming software suit. Players can find the newest video slots and other games every month. For the month of September you can enjoy the following new 5 reel slot machine games: DOCTOR DOCTOR Sneak A Peak Doctor Doctor is a truly stimulating prescription for fun and..
August 30, 2007. New Sign-Up $100 Free Bonus At River Belle Casino. River Belle Online Casino has updated their sign-up offer to 100% match up to €100. The offer is also available in $, UK £ and C$. 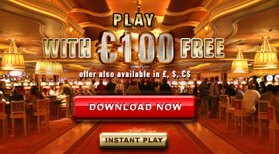 To claim your exclusive bonus simply download River Belle's free casino software, login to the casino lobby, make a deposit of up to €100 ($, C$ or Pound) and claim your 100% match bonus - double your money! August 22, 2007. Online Casino Classic Launched Its French Web Site. CasinoRewards group is extending its offering of languages as quickly as possible. This week they have launched French Casino Classic site, which will also be followed by a Spanish site in the near future. The casino offers €500 and one free hour for all new players to win as much as they can. August 20, 2007. Slotland Casino's 9th Birthday Party - $9,000 For Grabs In August. This month Slotland online casino celebrates its 9th birthday as a fun and successful online casino. Usually, someone else's birthday mean giving presents, but for Slotland's birthday party, the casino giving gifts to its players! In addition to Slotland's regular weekend promotion, for the month of August only, the casino is..
August 12, 2007. Online And Mobile Gambling Is On The Rise In UK By The Gambling Commission's Survey. Great Britain's regulatory body for casinos, bingo, gaming machines and lotteries, the Gambling Commission, has announced the increased numbers of people going to gamble online in the UK. The Commission released its findings in its latest survey carried out in June. The results of the survey show that 8.6 percent of UK adults had..
August 11, 2007. All Jackpots Casino goes International With New Multi-Lingual Software And Support. - Full customer support by language. New players at All Jackpots receive 400% match welcome bonus of €/$200 free. August 3, 2007. Promotions And Special Bonuses Of Las Vegas USA Online Casino - Get Up To $25,000 Free. Las Vegas USA online casino has just updated its welcome bonuses. Make an initial deposit of between $10 and $100 and get a 125% sign-up bonus of up to $125 free. American and International players are welcome. make an Initial Deposit of between $101 to $100,000 and get 125% on the first $100, PLUS 25% on the amount over first $100. That's up to incredible $25,000+ free to start. High rollers and jackpot hunters should not miss this awesome opportunity to getso much free money from the casino. NOTE: You MUST email casino support and claim your bonus.